I was looking for a `Stewie¬ pattern for long time... Thanks for you to share with us. I`m from Brazil (47 years-old) and I love to knitt... Your blog is so nice!!! My son-in-low adore the Family Guy, and Stewie is your favorite! Now I`ll knitt one for him and when I finish I`ll show you how he looks like. I hope you understand-me, I know my english is not the best. I'm glad you like it. Let me know if you have any questions. I would love to see your Stewie doll when you finish it. And your English is certainly much better than my Portuguese, which is nonexistent. of course I nedd to make one more! I`m in England visiting the family. Thanks again for share the pattern! 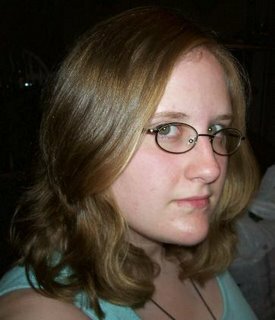 Of course I can't actually read your blog, but the pictures look great. He turned out really cute! I'm sure the next one will too. OMG. Just came over from Ravelry...this is brilliant. Thank you for sharing the pattern. And so he's finally taken over the world! Thanks! Glad you like it. Hope all your friends do too. Hi Carissa. Your Stewie is fab!!! 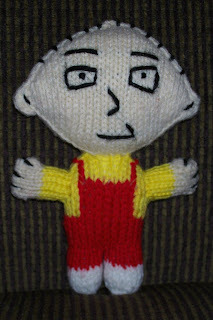 We are always winding up my fiance about how much he and our son looks like stewie so I am going to knit them one each now :o) Kelly. Thanks! Glad you like him. Hope your fiance and son do too. I was rambling around Ravelry and stumbled upon your Stewie pattern...Love It! If I had any ink left in my printer I would be downloading and tossing the stash to make one right now..making a note to myself to come back later. In the meantime, thanks for creating and sharing Stewie :-) (P.s. Im not anonymous; I just can't seem to get along with Google/Blogger), Bev, lazytvknitter on Ravlery where I am photoless...need to get a digital camera too.